A champagne burger on a beer budget? Whatever you call it, 500 Degrees offers a truly decadent burger experience, quick-service style, at a price point that should guarantee many happy return visits. No shortage of great reviews already (unbreaded – yelp – fat kids approve) so I’ll limit my comments to some of the areas that have received perhaps a bit less acclaim. 2. Kudos for wrapping the burger in paper, not aluminum foil. Sure you may argue heat retention, but most people are going to bust into their burgers in mere moments, not hours. Wrapping them in paper is not only aesthetically pleasing but it is also a sign of the care taken in every step of the process. Not that we are talking major league origami here, but wrapping a burger in paper takes time and thought. I am fairly certain my 11 month old could wrap a burger in foil…not a chance he could master the flips and folds needed to put one in paper. It is these “little things” that make 500 Degrees stand out from the pack for me. 3. The price is more than fair. 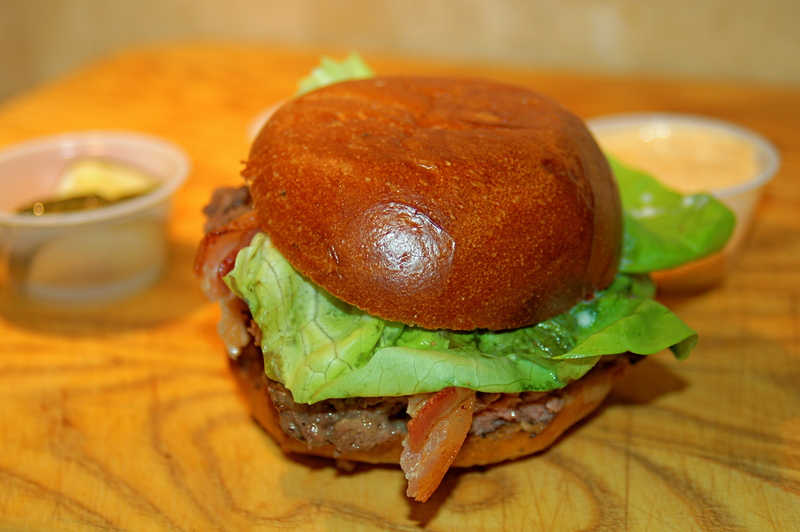 $5.75 for the signature “500” burger with lettuce, tomato, cheddar cheese, bacon and special sauce served on a locally-sourced, top quality bun. Add $2.50 for fries (3 styles – plain, spicy and truffle – I had none this trip) and $1.50 for a soda (pre-City soda sin tax) if you bundle it all up as the #5 combo. It adds up quickly, but not outrageously, to $9.75. A worthwhile splurge. Though success is never a certainty (especially in the restaurant biz), Wasserman’s thinking here seems to be spot on. 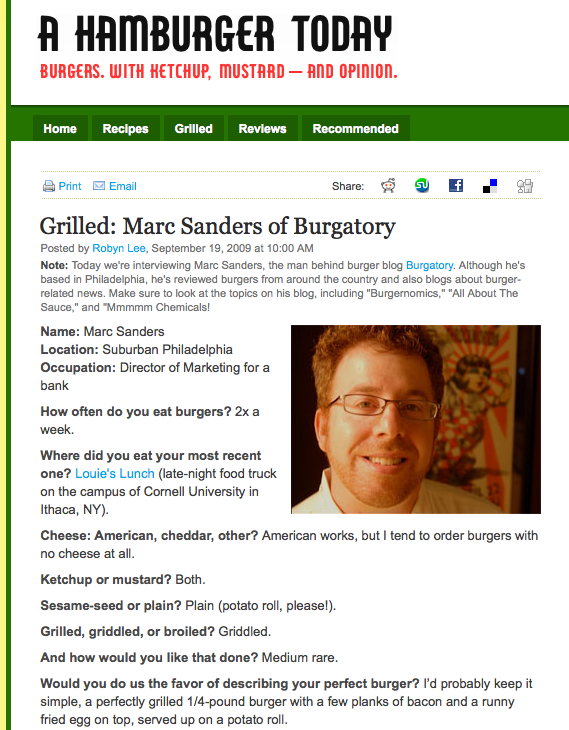 Offer more people access to his already highly acclaimed and sought-after Rouge burger by porting it to a more high-traffic neighborhood and shrinking it to a size allowing him to slot it into a decent price point. I don’t necessarily think Wasserman is going to cannibalize business from Rouge with 500. I think they are two distinct experiences, targeting two different demos. 15th & Sansom isn’t Rittenhouse. 500 Degrees is comfortable and well-designed but the average person will be in and out in under 15 minutes. A trip to Rouge warrants no less than an hour to soak in the atmosphere and menu, which is voluminous in comparison to 500’s strategically spartan offerings. Additional notes…Vegi-terrestrial wife ate half of my burger and then lamented the fact that I didn’t bring home two burgers. Might need to make picking these up a habit to ward off her slow descent toward a raw foods diet…Despite what the Inquirer wrote earlier this week, I am a fan of the new parking meter kiosks. With one just outside 500 Degrees, if the parking gods are with you, you can make a quick stop without having to pay outrageous parking garage prices. Plus, you can pay with a credit card!…I have a satellite work location about 2 minutes from 500 Degrees, and despite the hit I would take with City wage taxes I might need to put in for a transfer. *Will anyone else back me up on the pickle seepage thing? It is a cross platform pet peeve for me, too. I may hate it even worse on a Chik-Fil-A Chicken sandwich where you get that odd green halo on the chicken patty when you open up the bun to douse it with that cracktastic “Polynesian” sauce.